We have to confess that Samoas are our favorite Girl Scout cookie by a landslide. How can anything compete with chocolate, caramel, AND coconut? This year, instead of pouting about the short window in which we can get our hands on these tasty morsels, we got to thinking of ways to enjoy the flavor of Samoas all year long, and came up with a dessert we’re pretty darn proud of! 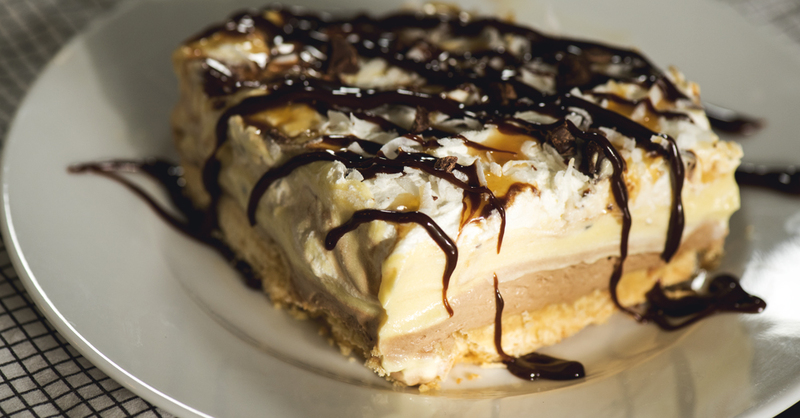 Our cool and creamy concoction starts with a coconut shortbread crust, and only gets better from there, with layers of creamy chocolate, caramel, fluffy whipped topping, and of course an ample amount of coconut flakes. On top of being delicious, this dessert keeps well in the fridge or freezer, so it’s the perfect thing to make ahead, impressing guests every time! Preheat oven to 325º F and line a 9x13-inch baking dish with parchment paper, making sure to leave 1-2 inches hanging over the sides for easy extraction. Start the crust by sifting flour and powdered sugar into a large bowl or food processor. Pulse or cut in the cubed butter using two forks. Mixture should resemble sand. Turn dough out into lined baking dish and use your hands to press dough into an even layer that reaches the sides and fully into the corners of dish. Place in oven and bake for 22 minutes, or until golden. Remove from oven and let cool completely. For the chocolate layer, combine cream cheese, hot fudge and powdered sugar in a large bowl or mixer, and beat together until smooth. Once combined, fold in cool whip. Start on pudding layer by heating caramel sauce in a microwavable bowl for 30-45 seconds, stirring halfway through. Pour warmed caramel into a large bowl and whisk in pudding and milk until smooth and thickened. 2-3 minutes. Stir in cool whip, then place in refrigerator until chilled. Take chocolate cream cheese mixture and spread it over cooled crust. Gently spread pudding mixture on top. Top with cool whip, toasted coconut flakes and chocolate chips, if using, and drizzle with hot fudge and caramel sauce. Place in refrigerator for at least 2 hours, or until chilled through, then slice, serve and enjoy!